Ahsoka is dead (or is she?). Kanan is blind. Ezra is in possession of a Sith holocron. 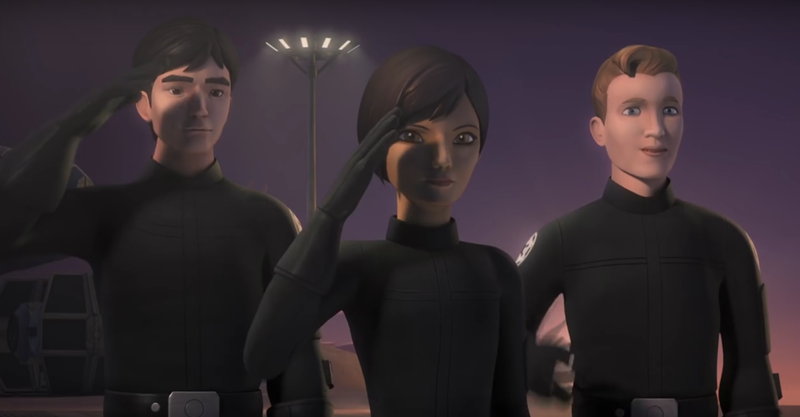 The ending of season 2 was exciting and devastating for fans of Star Wars Rebels. Our heroes seem to be at a real crossroads in their lives and where they go next is anybody’s guess. Darth Vader limped off damaged but alive after a fierce battle with his former Padawan. Darth Maul returned to sow seeds of discord and to achieve his own manipulative ends, but exactly what those are has yet to be seen. And Ahsoka Tano, one of the leaders of the fledgling Rebellion, is seemingly dead. Our heroes limp home to the newly established Rebel base as they reunite with Hera, Sabine, Zeb, and Chopper. At Star Wars Celebration, a preview of Season 3 was shown to the crowd and later uploaded to YouTube which reveals some interesting new pieces of information about what we might expect. Ezra has changed since the end of Season 2. Gone is the long, floppy hair and boyish smile and instead a more serious look adorns Ezra’s face (and a haircut that looks a lot like Kanan’s used to be). Speaking of Kanan, he now wears a helmet that covers his eyes and has grown a beard and mustache. And Sabine’s hair is now white/silver with purple tinges and she too looks like she has grown up a lot. Beyond the superficial, Ezra has grown in his skill and strength – but not always for the better. He has indeed been toying with the Sith holocron and it has influenced him. He says early in the preview that he will do anything to prevent his friends from getting hurt – a promise made by another Jedi once, Darth Vader. Will Ezra’s path continue in that direction? 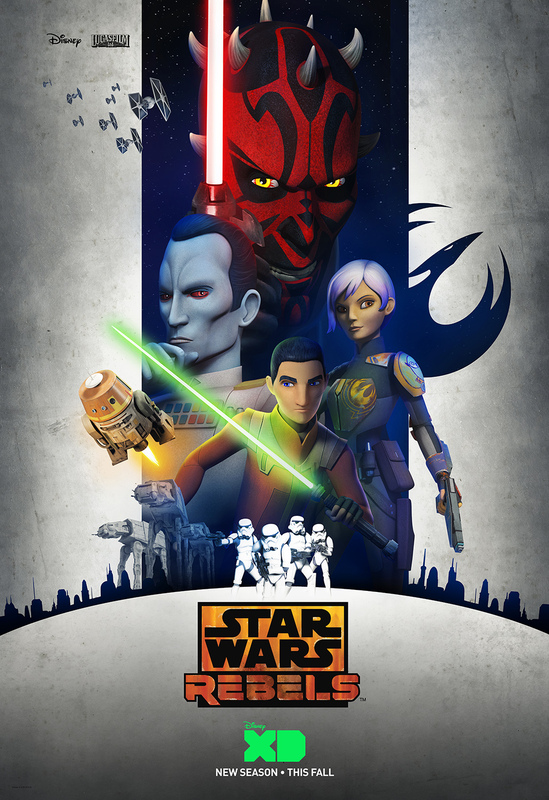 The preview shows Ezra learning from Darth Maul so be on the lookout for him this season as well. “This is TIE-SS25. 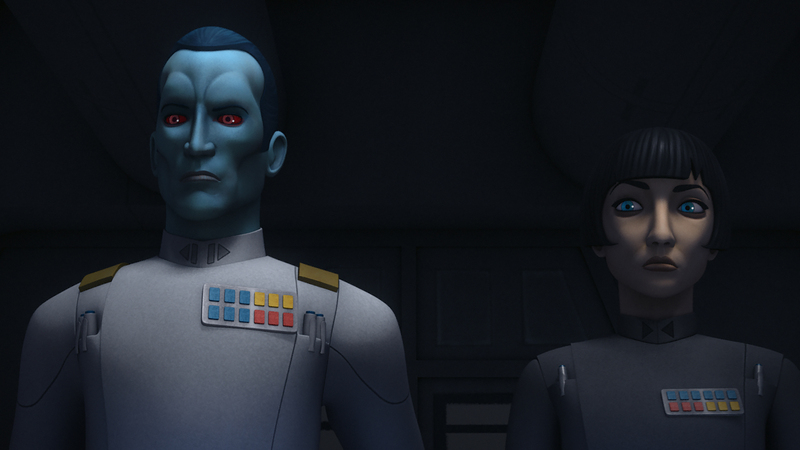 You can call me Wedge.” – Does Wedge Antilles join the Rebellion this season? Is that him as a young Imperial cadet defecting? 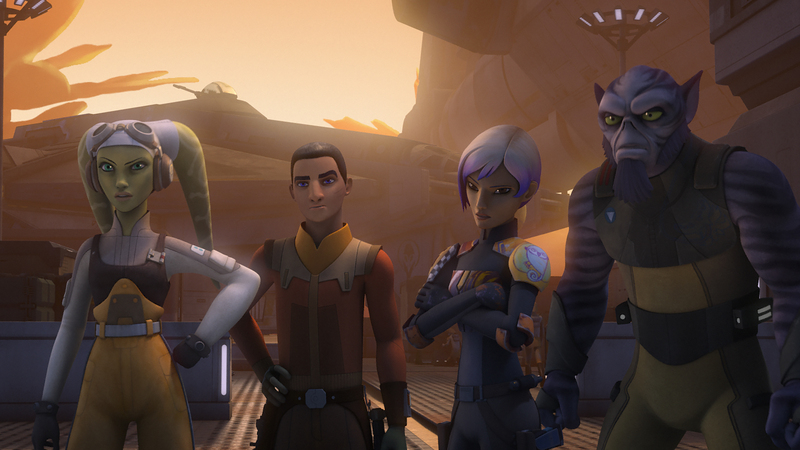 Sabine’s story takes on more depth entering into Season 3. A huge focus on the Mandalorians including a significant portion of them taking sides with the Empire will be part of her story. Hondo returns. Kanan’s saber turns purple. Hera’s dad returns. But for me, the most exciting part is witnessing the introduction of Wedge Antilles to the Rebellion. In the preview we hear that Imperial cadets from Sky Strike Academy wish to defect and then we cut to an Imperial pilot who announces, “This is TIE-SS25. You can call me Wedge.” Cut to Wedge saluting as he joins the Rebellion. Yay! But the biggest reveal of all was Grand Admiral Thrawn. Introduced by Timothy Zahn in Heir to the Empire, Thrawn has long been a fan favorite. With his blue skin, red eyes, and highly intelligent and creative strategic thinking, he is a true nemesis and seeing him in Rebels makes me smile and shiver at the same time. In some ways, Thrawn is more dangerous than Vader. With Vader, you just never want to run into him because he can take you down in a moment. With Thrawn, you just won’t see him coming. This should be an exciting year. What are you most looking forward to in Season 3?